Most college students don’t really know how to write a term paper the right way. This is the truth, according to various studies. In other words, most students are not able to write an excellent term paper because they don’t know how. After all, students are not professional writers. Their academic writing experience is quite limited, to be honest. However, you shouldn’t worry about it too much. There are ways you can improve your writing skills and your term papers. And writing a term paper outline is one of the best ways to improve your academic writing skills. Let’s see what an outline is, why it is important, and how to write one properly. Of course, some useful writing outline tips and tricks are included towards the end of this blog post. What Is a Term Paper Outline? As you already know, a term paper is a kind of research paper that is due at the end of the term. The grade you receive on this work has a significant impact on your overall grade. This means that you want to make sure that the essay is perfect in every way. An outline is just a way of organizing your thoughts and your paper. It is similar to a table of contents. Or, as we like to think of it, the outline is the skeleton of your research paper. You create the outline first, when conducting the research. All major points of discussion and all of the most important ideas will be included. Each major idea will be a heading in your outline. Less relevant ideas and discussion points will be included as subheadings. So, as we mentioned earlier, the term paper outline is just like a table of contents of your research paper. The term paper outline helps you clarify your ideas. Writing the outline helps you remember all important ideas. The outline helps you structure your writing in a logical manner. The outline helps you stay organized. The outline helps you stay on topic. 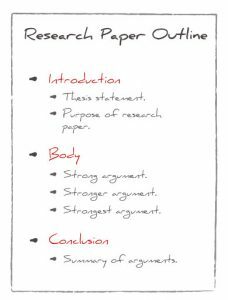 The research paper outline helps you balance your writing and improves its flow. And there are many more benefits, including the fact that you can easily visualize your ideas. Now that you know the importance of outline, let’s see how you can write one quickly. Start doing the research, as you would for any research paper. Identify the major ideas and talking points and write them down. This is the first step of writing the outline. Organize the sections in a logical manner. Think about the outline as the skeleton of your paper. Add important talking points and ideas beneath each major section as subsections. Continue to add sections and subsections to the outline. Don’t be afraid to delete sections that are redundant or irrelevant. Read the research paper outline and make sure it covers everything. You can reorder the sections or reorganize them in any way you like. And this is how you write term paper outline quickly. It wasn’t very difficult, was it? Now all you have to do is add content to each section and subsection. Don’t be too strict in your outline. Allow other ideas to grow and keep an open mind. Don’t rush the outline. You can work on it for two or three days. Write the outline in a natural way. There is no set structure that you need to follow. You can use bullet points, numerals, letters, etc. to structure your outline. You should include a short description of each section and subsection in your outline. It is always a good idea to show the outline to your teacher and ask for feedback. Truth be told, writing a term paper is not as difficult as you think it is. Using a good outline to organize your ideas and guide your writing is usually enough to get a good grade. But of course, your ideas and your academic writing skills matter as well. Good luck!